Almost everyone I know has read GONE GIRL by Gillian Flynn, and it’s no real surprise because that book is ballin’. 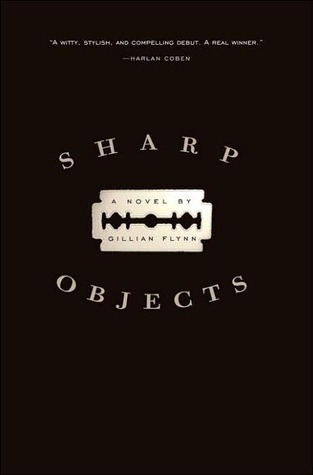 Last week, I was looking for new reads and after crusing through my local library’s available e-books, I checked-out SHARP OBJECTS aka The Creepiest Book I’ve Read In Recent Years. The main character’s name is Camille and she isn’t your standard journalist. Fresh from a stint at a psych hospital, Camille is sent from her urban environment back to the hick-ish place where she grew up, and she isn’t too psyched about it, to say the least. But her newspaper needs a scoop and there’s been a couple of child murders in her hometown, so off she goes. Naturally, she’ll be staying with her mother, which, if she were any normal mother would be fine, but Camille’s mother is a total freak show. A neurotic and cold woman who’s more concerned with her youngest daughter, a thirteen-year-old, than she is with Camille. It didn’t take more than a few pages of their interaction to realize that Camille probably wasn’t hugged enough as a kid. Any by enough, I mean at all. If you’ve ever seen the movie “Forgetting Sarah Marshall,” you know that Jason Segel’s character is in charge of playing “dark and ominous tones” for a CSI-ish TV show, and if there were to be a soundtrack to SHARP OBJECTS, they would most certainly include dark and ominous tones. Like, for the entire book. With no breaks. Ever. So if you like the sounds of that (ha) then pick up SHARP OBJECTS. But…err…do it with caution, if you’re a bit of a wimp like me. I'm wimpy but curious. I don't know which side will win because I do want to read this but I don't know how much creepy I can handle! this totally sounds like a book for me :) lol i like scary/dark/freaky sometimes.